Soaring 33 floors over the sidewalk it was the tallest and grandest hotel in the world. Today the Book-Cadillac finds itself in an entirely different situation.On December 10, 1924 the Book-Cadillac Hotel opened as the pride of Detroit. Soaring 33 floors over the sidewalk, it was the tallest and grandest hotel in the world. Opening with a lavish banquet, 60 years of service to Detroit society and the travelling public began. Today the Book-Cadillac finds itself in an entirely different situation. Vacant since 1984, the grand hotel is now threatened by demolition. A preservation group feels that such a loss would be a terrible blow for Detroits revival. "Simply stated our goal is to see the Book-Cadillac Hotel survive for another 76 years and more," says the opening page at www.book-cadillac.org. "The Book-Cadillac is an irreplaceable treasure, a strong statement to the era that built it. We will never see the likes of the Book-Cadillac built again." Designed by architect Louis Kamper and built in 1924, according to "The Buildings of Detroit," by W. Hawkins Ferry and published by Wayne State University Press in 1968, it was one of the citys most lavish hotels, featuring 1,200 rooms, an ornate lobby and a main restaurant decorated with murals and gilded mouldings. According to Hawkins Ferry, "two chandeliers each containing more than a ton of crystal  hung in the grand ballroom. Guests included Presidents Truman, Eisenhower, Kennedy, Johnson and Nixon." Located across the street from Detroits famed Lafayette Coney Island, the Book-Cadillac is currently downtown Detroits biggest unused building. Back in 1915, the Book Brothers J.B., Herbert, and Frank had a vision for Washington Blvd  to become the "5th Avenue of the West." The Books planned to accomplish this feat with the construction of a series of new buildings along the thoroughfare filled with fine offices and shops. 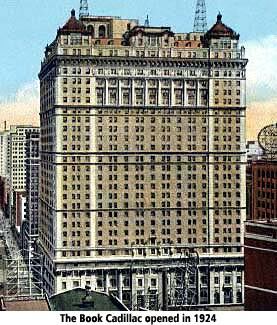 In 1917 the brothers purchased the old Cadillac Hotel at the corner of Michigan Avenue and Washington Blvd. However, the First World War made materials for new construction hard to obtain. Thus the Books had their architect, Louis Kamper, renovate the old Cadillac; it was a temporary fix. By 1923 the old hotel was gone and work had begun on the Book-Cadillac. Though an established architect, Kamper had little experience designing hotels. To gain knowledge of hotel layout, he studied the Statler Hotels in Detroit and New York, among others. He had plenty of knowledge for decoration and chose an elaborate Venetian style of the Italian Renaissance. He gave the lower five floors of the exterior a stone facade. The ground floor was given over entirely to shops and featured ornate metal storefronts. Above these were tall arched windows set between massive pilasters. No matter which angle you saw it from, the Book-Cadillac was a dramatic addition to the citys skyline. The interiors were equally impressive. The Book-Cadillac featured five floors of grand public rooms and shops. Among the amenities were large lounges, three dining rooms, a coffee shop, three unique and functional ballrooms, and a tearoom. They were the most richly decorated interiors found in any Detroit hotel. All told, the Book-Cadillac was a massive construction project requiring two years of planning. At 33 floors it was both the tallest building in Detroit and the tallest hotel in the world. This no doubt being the reason that the top floor had a radio station, WCX. The hotel had a total of 1,136 guest rooms. There were 1,035 bedrooms, 54 sitting rooms, 8 alcove rooms, and 38 sample rooms. The silver service contained 50,000 pieces. Three basement levels contained the most modern boilers and laundry facilities of the time. The total cost of construction exceeded $14 million. The Book-Cadillac enjoyed success for six years. However, with the onset of the Great Depression the situation began to sour for the hotel. The great ambitions of the Book Brothers were cut short. A massive 81-story Book Tower would never be built. In 1931, the hotel was forced into receivership and ultimately changed hands twice in only 20 years. For a time it was controlled by Ralph Hitzs hotel organization, a chain renowned for the attentiveness of its service. To remain competitive in lean times much of the public room decor was redone in the late 1930s. The dining rooms were redecorated in the Art Moderne style and given new names. The old Venetian dining room had outlived its utility and was replaced by the Book Casino. This new nightclub would become a legendary nightspot in the Detroit area. Here patrons could enjoy fine dining, big bands, and dancing. Another moneymaking scheme tried by the hotel at this time was less successful. The Cadillac Apartments were portions of the hotel rooms that had been redecorated for apartment living. Hoping to cash in on the glamour of the exclusive apartment hotels as well as downtown convenience, the Cadillac Apartments offered rooms starting at $60.00 a month. The post World War II hotel industry was ruled by the big chains. In 1951 the hotel was purchased by the Sheraton Corporation for $6 million. Sheraton went about modernizing their newly acquired hotel. The grand staircase on Washington Blvd. was replaced by a duel escalator setup and the lobby colours were converted to a "ketchup and mustard horror." Only the ballrooms and Italian Garden were left untouched. The renovations did the trick and during the 50s and 60s the hotel was a top money maker for the company. However, the hotel industry was steadily losing more and more guests to newfangled motels. In the 1970s things once again turned sour for the hotel. By 1974 its one time rival, the Pick-Fort Shelby, closed, reopened as the Shelby Hotel, and quickly closed again. Just down the street the mighty Statler had been sold by the Hilton chain to a group of local investors. Quickly the Detroit Heritage Hotel, as it was then known, flopped. It closed in 1975, resulting in a devastating loss of up-to-date convention space and facilities. In the late 60s and early 70s, the Book-Cadillac underwent more renovations that included a 1974 attempt at more convention space. Sheraton realized the hotel needed major structural renovations and reconfigurations at a price they were not willing to pay. In 1975 the hotel was sold to experienced hotel operator Herbert Weissberg. Weissberg announced major renovations that would attempt to bring back some historic character to the building, which he renamed the Detroit-Cadillac. Despite economic successes Weissberg lost control of the hotel when the banks foreclosed. The Radisson Corporation was called in to supervise another $6 million worth of renovations and then operate the hotel afterwards. It was now the Radisson-Cadillac. The hotels fortunes did not improve and it changed hands several times in five years. 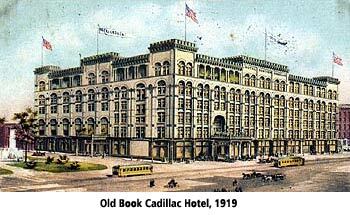 However, part of its old self did re-emerge in this time, it was once again the Book-Cadillac Hotel. Operating losses skyrocketed in the late 70s and by 1979 it was announced that the hotel would close. Not wanting to see another hotel close, have the city lose needed hotel rooms, and lose face in the coming Republican National Convention, the Detroit Economic Growth Corporation rescued the hotel. Operated by a partnership called Book-Cadillac Properties, the hotel was on a limited reprieve. In 1983 it was decided a way had to be found to make the building self-supporting. Several renovation schemes were studied. It was decided that the hotels best chance was to become a mixed-use property. It was felt that the building could not survive as a hotel alone. It was simply far too large, even with nearly 500 unused rooms. A study found that some 92 percent of the hotels room revenue was generated by only 528 rooms (53 percent of the hotels rooms). That added to the figure of 25% percent occupancy for non convention room nights that Detroits hotels then suffered meant the Book-Cadillac could no longer survive with any number remotely close to its full 1,200 rooms or continue to survive with 47% of its rooms generating no revenue. In 1983 some work on this idea was begun. A portion of the lower floors were converted into offices. The 9th floor was turned into a fitness centre, to cater to the office tenants. However, the main renovation would require the hotel to close for over a year. That it did in late 1984. The shops on the arcade remained open, as did a few offices, but the bulk of the building was now unused. Soon developers dropped out. One after another they signed on only to abandon the project, citing economic conditions. Adding to the trouble were skyrocketing renovation costs. Fifteen months passed; still the hotel sat empty. Finally in 1986 the building was liquidated. Furniture, fixtures, china, silver service  it was all sold off. With the hotel portion now truly empty, the Book-Cadillac Plaza scheme was scuttled. The last businesses left their arcade homes. Boards went up. The Book-Cadillac joined the list of abandoned buildings. During this time the city posted a guard inside the building. His job was to keep out the vultures who had already gutted so many of Detroits abandoned gems of decorative plaster and brass. He performed that job well, until 1997. In 1993 Coleman Young unsuccessfully attempted to get money to demolish the building. The guard was then pulled out and the building was quickly stripped of its decorative pieces. In early 1999 the hotel once again became the subject of the citys attention. It remains to be seen if the citys motive is demolition or renovation. However, as long as the Book-Cadillac remains standing, there will always be a chance of it rejoining Detroits viable hotels.